de Vries M, Ouwendijk R, Kessels AG et al: Comparison of generic and disease-specific questionnaires for the assessment of quality of life in patients with peripheral arterial disease. J Vasc Surg, 2005, 41: 261-268. 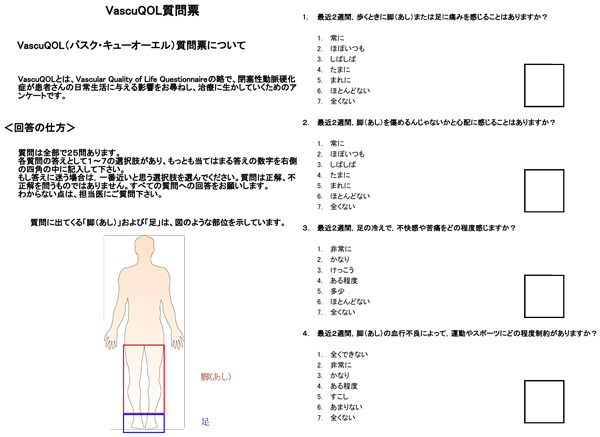 Morgan MB, Crayford T, Murrin B et al: Developing the Vascular Quality of Life Questionnaire: a new disease-specific quality of life measure for use in lower limb ischemia. J Vasc Surg, 2001, 33: 679-687. Izquierdo-Porrera AM, Gardner AW, Bradham DD et al: Relationship between objective measures of peripheral arterial disease severity to self-reported quality of life in older adults with intermittent claudication. J Vasc Surg, 2005, 41: 625-630.